NT2A, Large diaphragm condenser microphone from RODE. melou2003's review" Impeccable in lots of different configurations"
A very heavy condenser mic that inspires confidence. I bought it knowing I should pare it with a sturdy mic stand. I used it essentially to record vocals, since I already had an NT55 for my guitar. After several trials, various positioning changes, equalization, compression, I found I actually preferred the NT2A for my guitar (instead of the NT55). I plugged it, placed it about a meter in front of the guitar, slightly offset to the left of the guitar's sound whole, and it worked great. I hardly touched the EQ, and only did so to dig a little medium heat hum sound. "Vintage" studio mic, both in terms of sound and design! After having looked for THE mic for a long time, including lots of comparative tests (neumann, shure, seinnheisser, akg, etc), I gave a try to this rather classic-looking studio mic. As soon as I had it in my hands I felt reassured by its weight (so watch out for the boom stands), it's not a plastic mic! I plugged it into my small H4 to make some tests and boy was I surprised: an awesome "vintage" sound! With an H4! I checked the settings on the zoom and realized everything was flat! I asked if I could test it with an avid system (which was displayed at the store) and I wasn't the only one in shock! This mic has an excellent sound quality (if you like vintage sounds), worthy of better-known products. When I asked the price I was dumbfounded! I thought it would be around $500-$600 and it was only $380 with shock-mount suspension and (removable) anti-pop filter! The store must have gone out of stock with the dozen clients that were in that day! It certainly won't oust a U87, but at this price, it's unbeatable! hhub17's review"All-purpose, good performing mic"
Very versatile, due to the polar patterns available (omni, cardioid, figure 8) and low-pass, as well as pad: You can record percussion vocals, piano and everything else you want, with the only condition that you need to have some time to test the settings: 3 polar patterns x 3 filters x 3 pads = 27 possibilities. Large-diaphragm, condenser mic, which means it needs 42V phantom power. To make yourself an idea, you can make simulations at Rode's website: You need to send a recording made with another indexed mic and then listen what it would sound like with the NT-2A and these or those settings. Nice and interesting, but you should always take the results with a pinch of salt — it's their site. They also have pedagogical videos regarding the capturing of sound. I have no shock mount, only a standard screw-on clip but the low-pass filters out lots of annoying rumble from the ground. It's practical and improves the recording, while also reducing the need for digital processing afterwards, like using a digital filter after digitization. I have it since 2006 and I didn't test anything before: There was simply nothing comparable at this price point back then, I think. And I still think the same today. I use it with an MC200 Behringer preamp, and it sounds pretty good (even if I think the tube must be changed), or with a Toneport UX2 when it is in the mood for working, or even with my small Alesis USB mixer. It comes out clean and clear out of all of them, without any shrill, but you obviously need high-end hardware to get the best out of it. The pros: It is not only versatile, it is good and not expensive. It's even a bit too good: You can clearly hear the noises from the computer and even the fridge in the room next door. I'll have to isolate better my studio. The cons: I got mad when I saw that it is now sold with a shock mount for the same price. And you must also be careful with mic stands that are too light, since the mic has a considerable weight. I don't know if it's fragile, I have always taken good care of it. In hindsight, I'd buy it with the whole kit rather than having to settle for the mic clip. This condenser mic is primarily a studio mic. I've never heard of it being used live, and wouldn't recommend it. I have used it mainly on vocals and guitars, both electric and acoustic. I've heard that they've been used to record an amped Fender Rhodes or a Wurlitzer as well, though not owning either of those instruments, I can't say for sure. I've only used this mic for a few months, but I've grown pretty fond of it. While it's not my go-to mic for most projects, I like the way it sounds for some singers, particularly when I record myself. I like the rich, smooth tone that it provides. The vocals I recorded with it were rich and powerful without being raw or grainy. They are great for baritones and bass singers more than alto or sopranos, though most male vocals will sound pretty good with it. It doesn't tend to sell the higher registers as well as the lower ones. I've also had pretty good when recording acoustic and electric guitars (at least when the electric is clean, and not cranked too loud). It gives them a similarly rich, warm sound that sits well in a mix and doesn't really get in the way. I've never compared it to the older Rode models but I can't imagine it not living up to, or exceeding them, in terms of quality. 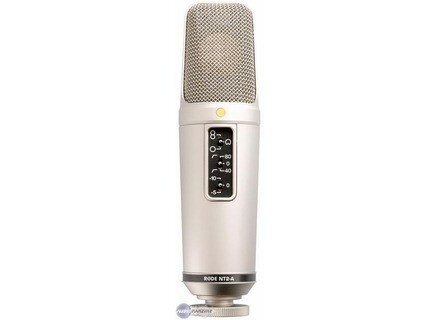 I think that for the price (I got it for $400), these are not too bad, but don't make it your first condenser mic. I say this because its not exactly the most versatile condenser mic you can get and it's definitely a more particular type of sound, most likely one that you won't be using that much. It's certainly not a bad first choice but there are better ones out there. For someone with a larger collection but not much of a budget, look into this mic. It's served me well and it will most likely serve you well too. The NT-2A from Rode is without a really nice mic. Rode is known for making really high quality gear at a price that most people can actually afford without maxing out their credit cards, and this is a definite case in point. I like to think of this mic as an upgraded NT1A, because it shares similar sonic characteristics except that it is improved just a little bit on most levels. This mic still has a great SPL tolerance, except that on this mic you get a switchable pad that will give you either 5 or 10 dB of attenuation. I have personally never needed it, but it's there if you record really loud things. You do get a bass roll off filter on this mic, which is nice for dealing with any rumble if you're in a less than ideal acoustic environment. It has two settings with roll-offs starting at 40Hz and another one at 80Hz. This mic is actually also a switchable polar pattern mic. By default you'll have your average cardioid pattern for a large diaphragm condenser, but you can switch this to pick up in a figure 8 mode, and also an omni mode. That adds to the value of this mic a lot due to making it extremely versatile. This mic, to put it succinctly, sounds way better than it costs. I would defy anyone to listen to this mic blindly and not over-estimate the price tag on it by $500. Rode's NT line is a great value, and the NT-2A is perhaps the best value of the line, though it may not be the best sounding. Overall this is a really good sounding mic, and you'll get very smooth, pleasing tones through it. The bass response on this model, for some reason, tends to be a little bit light, but for most sources that you'd record with this type of mic that is not really a big issue. I recommend it and it's a great value. Ptilou's review (This content has been automatically translated from French)" Excellent Q / P"
It is a static capacitor, looking tough and with three directional. Very easy to use. Pad with 10 / low cut and -5 -80, -40. I use it mainly for cardio or even 8 Voice, drums, acoustic guitar, electric guitar amp ... Briefly, in use, or home studio studio again in the Classic Rock genre. I use it for 2 years. I went from home studio with dynamic mics (Shure or other such dynamic low-end), this static entry-level (<300 €). And despite the very moderate price, can be reached at a very VERY VERY top quality for voice, guitar or the drums taken. I do not really know the microphones over € 1000. But this one gives me satisfaction. In the budget include the suspension immediately if it is not sold with, and a foot solid, stable and durable. I lined the box in which it is sold foam and uses a small package for transport. It is light, convenient and sufficient nomad. LRStudio's review (This content has been automatically translated from French)" Excellent value for money"
I have not had large enough static membrane to make the best possible comparison, but I have heard recordings made with a number of static, and I honestly think he is doing well for its price, even compared to the Neumann! The sound is clear, straight, powerful, has great presence and is relatively neutral (I mean, there are no holes in the passband). It integrates a priori very well in a mix. The proximity effect (severe reinforced) is quite far, the pop filter is required within 50 cm. Besides the bundle version is very nice, support anti vibration and pop filter on the same piece, it's great! On the grave of a djembe, bass clean and defined sound perfect. On an acoustic guitar is clean, but lacks some precision, because of the low reactivity transients. If you do buy one microphone to catch live or re-recording, it is still relatively versatile, thanks to its directivity, and can therefore be a good solution. The directional precisely, are quite effective, even if I did not notice much difference between "8" and "Omni" (not tested too much to be said, since I only needed the "heart"). No breath, one of the quietest mics, market, noise from my PC (very quiet in real life, housing Fractal Design R3, about 25db) is much higher than the breath of the microphone. Obviously, product prices tight, no briefcase, just a protective cover standard is already something, but you take care of the microphone carrying case! Verdict: 5 / 5, recommended, value for money excellent! Révérend John's review (This content has been automatically translated from French)" Ie knife Mac Giver"
An omni directional static, at 8 and Cardio. Although built like a Patton, not the sand. I own a pair for 10 years. This is my first pair worthy of the name, before I had a pair of Samson CO1. His good side to take up all the microphones I use most often on just about any possible sources. The multidirectivité is a real asset. His record places that haunt much more expensive models and Chinese lamps, which are outright holes in the passband. With this micro there is no surprise all with a signature unique to Australia from Rode: Brilliant! Do not hesitate if you want a static quality with a price report. I'm going to go fast on this part, the Rode site is well done. It is a large diaphragm microphone with three electrostatic directionality (Cardio, Omni and Bi), two cups low (40 and 80Hz) and two attnuations (-5 and -10 dB). Trs low noise, output level comfortable plutt medium-high is a microphone sensitive enough. Caution is trs heavy prvoyez a good start with a good counterweight (or foot without pole). While the sound ... (I use a mk1 Goldmike, pramp lamp plutt prcis trs and transparent, it is obvious that the characters can change depending on pramp is used). Obviously the 3-position ring of Manir quite Different. Personally I do not like the bi-directional, the sound lacks a bit of air, space, and it is trs nose (quite dsagrable development of the band 800-1kHz). I do not use it I do not speak. In Cardio dj is much better. A diffrent distances the sound is always clear and Retailer. As you approach the microphone, the effect of proximity is very well gr and we will not need to break the overflow serious like crazy. The mdium trs is enjoyable, there is the body but is late. This is not a microphone to make voice raw feeding. The extreme acute plutt is highlighted but it shines with great gentleness and finesse also, it will not rise above the frquences 7kHz to mix because it gives micro really not bad, but we are not obliged to decline because they are pretty. There are between 2kHz and 5kHz that sound can be a bit "dr" according to sources and the proximity of it. Cel said nothing excessive, I myself even a voice so nasal and mtallique high enough, but I do not need to fall more than 2 dB EQ, and even while dpend catch the musical context ... (But if your a girl you have a nasal voice and your pramps are slamming trs / gloss, it may become aggressive). Please note I did not say that it was inappropriate to vote fminine, on the contrary it may be by the fineness and lgret he excels, the men could missing a little bit of low-mdium warm as that of NT2A plutt neutral or even a little cold. In short, we must think of it as a microphone 250 to 300 it will not be perfect! In omni microphone becomes neutral trs. Sr Although there is no effect but the proximity of small agressivit mdium also disappeared leaving a softer and finer the image of the extreme treble. It can sing without the microphone derrire concern (the sound is really a little less Retailer I doubt that being aware in a mix) but not on CTSO the we lose too much top-mdium and acute. In this directivity normment it lends itself to anything and can go anywhere you need a jack o soft, shiny and plutt ar. Over time I think I would take a deuxime NT2A to a pair of omni classical training and resume (quartet, choir etc ...) I am satisfied with trs trs but beware does not the torque of gear that could make the sound a bit harsh. At this price, and three directional possdant there that day, and I know that the C-3 of studio projects that I could not test it would be interresting to compare! Micro comes with multi fixing micro in a small house black. it's really a pleasure to work with a microphone of this type. I plan to buy 3 more!